Moving is our passion and we really care! We want to provide the info you need to relax about your move. We are a local moving company in Ottawa and we live here too. Easy Way Movers has more than 15 years of experience providing only the best in moving services. We are a licensed, bonded, and insured moving company. We mange all this, because strive to make moves easy. All our customers receive a personalized friendly and reasonably priced professional service. Courtesy, Friendly, Reliable, Punctuality, and Efficiency are our commitments with clients, because we want to be the best. Our staff will work with you to meet your schedule and physical demands. From packing, unpacking, and moving to pick-up and delivery service so while we do the heavy work we will help ease all the stress that comes along with moving. We offer the best service in the industry for moving in Ottawa or to some where else. Although our team is personable, it is comprised of professional, reliable, honest and experienced movers who strive to work quickly and safely with your possessions. Due to our high standards, you can trust our goal is to provide a stress-free service for all our Customers. 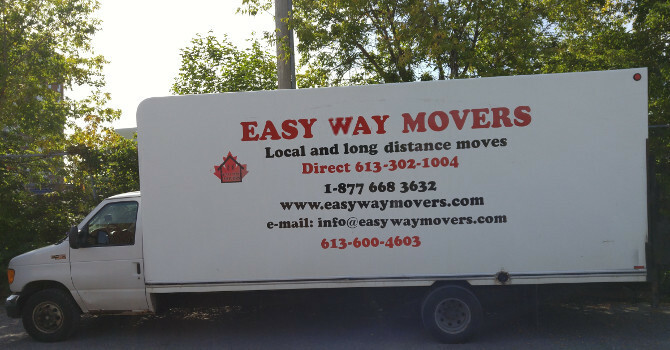 Easy Way Movers is your professional Ottawa mover serving the Nation’s Capital. Rather than wait, call Easy Way Movers today to book your move with us!